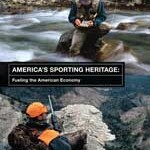 Jodi Stemler Consulting produced the Congressional Sportsmen’s Foundation’s 2012 report, America’s Sporting Heritage: Fueling the American Economy. The report translates complex economic information into compelling comparisons of hunting and fishing with more mainstream industries to show how important sportsmen are to the nation’s and every state’s economies. Jodi managed all aspects of the project including researching comparable industries, developing the comparisons, writing the content, overseeing the graphic design, and press outreach. In addition, in 2007 Jodi Stemler Consulting provided research and writing support for the organization’s report with that year’s economic data.